Q: What two things do Ripley, Ipperwash and Ridgetown all have in common? A: All have wind turbine developments and local residents have experienced weird electrical problems. Ripley had, and still has, severe stray voltage that seems to follow a buried municipal drain. Ipperwash had reports of blown-out electrical equipment (eg. One person reported 11 VCR’s in one year) and an odd case where Hydro insisted that a monthly bill for $7,000 was accurate and threatened to cutoff service if it wasn’t paid. 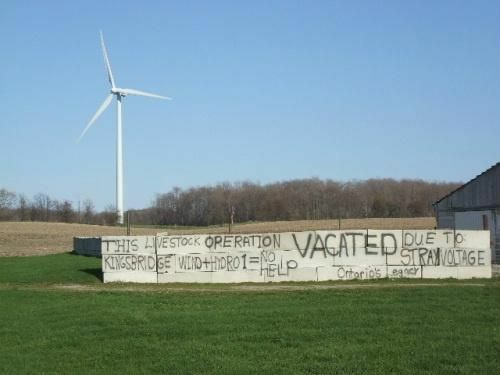 But the problems in Ridgetown have to take the cake. Nearby is the large Talbot wind project with 43 turbines. It went live last December. On March 5 there was a wide area that was hit with a “ground surge” of electricity, and then a blackout, all the way from Highgate to downtown Ridgetown. The surge lasted three seconds – doesn’t sound very long, but for an uncontrolled electrical event it is eternity. In that three seconds, tens of thousands of dollars of damage was done. Fortunately, there were no injuries. 1) Fax machines, computers, microwave ovens, smoke detectors (!!!) etc. were fried. 2) Fuses on numerous Hydro transformers were “popped” – in one case every one on a concession road. 3) An electrical transformer on a furnace at a local Ridgetown school caught fire and left scorch marks on the panel. 4) A resident reported flames shooting from an electrical receptacle with scorch marks on the metal and melted plastic. 5) Strangest of all was an inverter on a micro-FIT solar panel that was blown out – a $5,000 repair – not an item you would want to replace on a regular basis. 6) There were other, smaller surge events after this one, and then another big one on April 11. Residents were definitely spooked and highly annoyed with the cost of the repairs. Claims were put into insurance and some went directly to Hydro which turned them over to a contract adjuster, Quelmec Lost Adjusters, which specializes in “claim denied” letters judging from the two copies I have seen. So, Hydro chooses to employ an Ottawa-based company whose specialty is to “diss” the public. Worse, there is no attempt to investigate what is obviously a major system failure – one of the more significant ones to happen in Ontario in recent years. In light of the other problems that arise as soon as a wind project arrives, an investigation is the least that Hydro should do. 1) Hydro should have an independent analysis done by an engineering firm that specializes in forensic investigation of electrical systems. 2) Hydro must reimburse all legitimate claims for loss. A57 km/h wind is not a good-enough reason, and Hydro knows it. 3) There is incidental evidence that electrical disturbance is associated with wind turbine installations. Residents need an explanation why this is happening now, not after projects go up. Rural residents are supposed to do all the sacrificing for their bottom line. I think it’s time that our Hydro system looked after its customers first. Posted on September 9, 2011, in Electrical Pollution, Health. Bookmark the permalink. Leave a comment.